A mature typhoon produces as much power as half of the world’s power stations, according to the Atlantic Oceanographic & Meteorological Laboratory. But while such ferocious strength can wreak havoc when the typhoon hits land, one enterprising Japanese engineer is aiming to turn its force into electricity. Atsushi Shimizu believes that the energy from one typhoon could power Japan for 50 years, and he has invented the world's first "typhoon turbine" to help plug into that potential. The key, Shimizu says, was realizing that traditional wind turbines were not suitable for the region’s climate. "For decades, Japan has brought in European-style wind turbines, not designed for typhoon zones, and installed them with no careful consideration. They've broken almost entirely," the engineer told CNN . During Typhoon Usagi in 2013, eight turbines collapsed at China's Honghaiwan wind farm and a further eight were damaged, according to Windpower Intelligence. For many years, Japan thought its energy needs would be met by nuclear power plants. But when a typhoon hit in 2013 and led to the meltdown of the Fukushima Daiichi power plant, those plans had to change. "Japan has the potential to be a superpower of wind," says Shimizu. 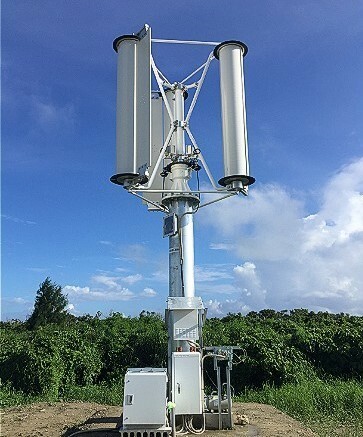 To capture the power of a typhoon, Shimizu’s company, Challenergy , designed a turbine with an omni-directional vertical axis that is able withstand Japan's unpredictable wind patterns. It incorporates something called the "Magnus effect", the force that causes a spinning object to deviate from an otherwise straight path, a bit like the topspin given to a cricket ball to give it a downwards trajectory. When the Challenergy team last simulated their invention in July 2015, it achieved 30% efficiency, close to the typical 40% efficiency levels of propeller-based wind turbines. In July 2016, the first prototype was installed in Okinawa. Now all the Challenergy team need to test their creation's efficiency in real life, is a typhoon.